The BOS emulsified fuel systems works on the principle of adding water into the fuel in such a way that it produces an emulsified fuel that creates a secondary atomisation effect after the primary injection process. The secondary atomisation effect creates even smaller fuel droplets after injection. This significantly improves the combustion of the fuel inside the engine cylinders as even more total surface area of the fuel is exposed to combustion. The secondary atomization process is illustrated in the picture below. What are the requirements of engine for EFS? Blue Ocean Solutions focuses on marine diesel engines. Our Emulsified Fuel System is compatible with both slow speed and medium speed marine diesel engines, and works effectively with both new and old engines as the secondary atomization effect is independent of the age of engines. Moreover, as the EFS is installed in the fuel oil service system of the engines, no modifications or adjustments are needed to the actual engines. How much space is needed for EFS? The actual size may vary and can be customised according to the engine room arrangement. What type of fuels can be used with EFS? EFS can be used with HFO, MGO and MDO to deliver confirmed and proven fuel savings and reductions in NOx. Chemical additives are not needed. The additional benefits of running MGO with EFS is higher viscosity and the cooling effect of water. There is no need for a cooler. Does EFS use any additives? How are we different from other systems? The BOS Emulsifier was developed after extensive research into methods for producing optimal water-in-fuel emulsions for achieving the best fuel savings. 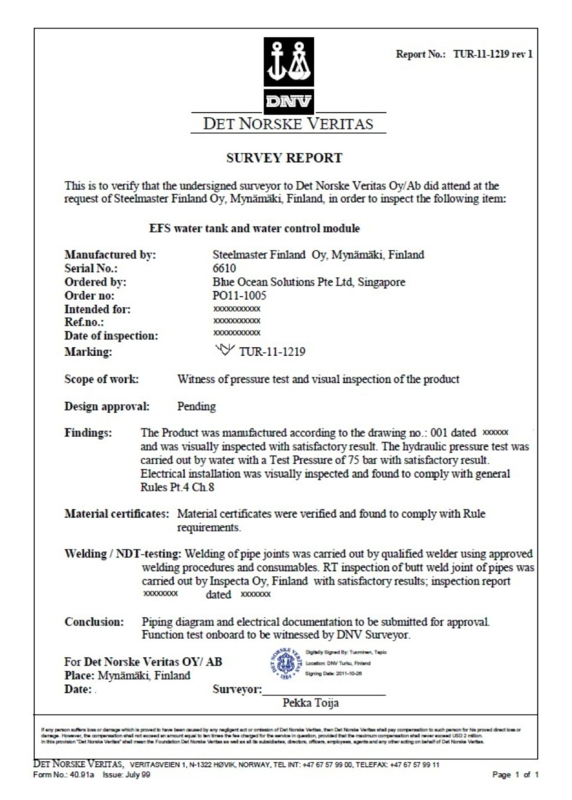 The non-dimensional emulsifier model (patented) was developed to ensure that the BOS emulsifier can be scaled to meet the fuel flow range for any vessel. Other emulsifiers in the market make use of one of the following methods of emulsification. Rapid performance deterioration due to the wear of parts in the marine environment. Unreliability because of the above reasons. They continuously break the water-in-fuel particles in the re-circulated fuel to nano-sized water particles which do not create the secondary explosion effect. Too small water-in-fuel particles do not have enough energy to produce the desired explosive effect. Can be scaled to produce optimal emulsified fuel for ships of all sizes. Are any modifications to the engine needed? The emulsified fuel system is installed in the fuel oil service system serving the engines. Therefore no modifications or adjustments are needed to the engines. Where is the EFS installed? The EFS is installed in the fuel oil service system serving the engines. Specifically, it is installed in between the booster pump (also known as the circulator pump) and the FO heater. The overall layout of the EFS in the FO service system of a typical marine diesel engine is shown in the diagram below. The original FO pipe between the booster pump and heater is removed, the fuel oil drained, and then the pre-fabricated FO pipes including the valves are reconnected. What is the operational downtime of the engine during the installation of EFS? Installation of the EFS does not require the ship to be in dry dock. As seen from the diagram in the FAQ immediately above, the three valves (one NO and two NC) can be retrofitted and installed while the ship is alongside in port transferring cargo or passengers. The installation of these three valves ensures that the engine has a continuous supply of fuel oil even though other parts of the EFS (the emulsifier, water tank, water control and control console modules) may not have not yet been fitted. These remaining EFS modules can be installed while the ship is at sea. Hence, the operational downtime during the installation of the EFS is effectively zero. The average time to install the three valves is around just four hours, and only during that period does the engine need to be powered down. At all other times, the installation of the EFS is completely independent of the operation of the main engine. Which ship activities could be affected during the installation process? The installation of the EFS does not affect any of the activities of the ship. The installation of the valves into the fuel oil pipes is done while the ship is at rest in port. The installation of the other components of the EFS including the water controller module and the ECR remote panel can be done without interrupting the operations of any ship’s systems, even when the ship is sailing. What is the percentage of water added? Based on our research and operational experience, the percentage of water added is in the range of 6 to 30% by volume. The optimum for most engines is typically about 10%, giving average fuel savings of between 2 and 5%. How does the system ensure that the correct percentage of water is added to the fuel? A closed-loop PID (Proportional-Integral-Derivative) controller is used to control the percentage volume of water added to the fuel in real time. The PID controller monitors the flow rates from the fuel flow metre and water flow metre and operates a continuously variable water control valve which maintains the volume of water being added to the fuel in the emulsifier unit at the predetermined percentage set point (i.e water flow rate/ fuel flow rate). A new fuel flow meter may need to be installed so as to provide the PID controller with a real time flow rate accurate to +/-0.5% as well as a digital output signal of 4-20mA. If there is not enough water, the PID controller will ease open the valve until the correct amount of water is being added. If there is too much water, it will reverse the control action and restrict the water flow. In this way, the emulsified fuel system always ensures that the correct amount of water is being accurately added to the fuel in a stable manner in real time, and in response to the actual fuel consumption of the engine. What are the properties of the water needed? From where should the water supply be sourced? For cruise ships or coastal ships, the water supply can come from the water bunker. In the case of ocean-going vessels, the water supply can come from the fresh water generator. In our experience, most fresh water generators have enough capacity to generate the amount of daily water needed by the emulsified fuel system. This is generally equivalent to 10% of the daily fuel consumption. In the event of any alarm, the auto-valves change position in such a way that the EFS is tripped and at the same time a bypass is opened to maintain an interrupted supply of fuel oil to the main engine. If the FO pressure is below or above a specific range, the EFS automatically trips so as to avoid damage to its components. If the FO flow rate is below a particular value, the EFS will automatically trip so as to avoid damage to its components. If the FO temperature falls outside of a specified range, the EFS will automatically trip so as to avoid damage to its components. For example, if the fuel oil temperature is very high and the pressure is also not up at a specific value, the water may boil and produce a steam block inside the FO pipeline. In the event of a failure of the auto-valves, the EFS has ball valves which can operated manually to by-pass the system and so ensure a continuous supply of fuel to the main engine. How do you ensure that the set water percentage is achieved? The EFS uses a PID (Proportional-Integral-Derivative) controller on the PLC to ensure that the set water percentage is achieved. The control method is shown in the picture below. 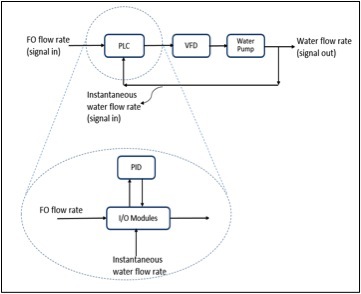 The flow rates of the water and FO are measured each second by the PLC and the percentage of water is calculated and compared with the set percentage. The flow rate of water is then adjusted accordingly in real time so as to match the set water percentage by increasing or decreasing the speed of the water pump using a Variable Frequency Drive (VFD). Can the EFS cause power failures? No, it cannot. The EFS is a fail-proof system which automatically trips whenever there is an alarm and at the same time opens up a bypass so that fuel supply to the engine is not interrupted. Emulsified fuel systems can cause black outs as a result of steam blocks. These occur when the water in the emulsified fuel boils before reaching the engine. This is the result of a mismatch in the pressure and temperature of the fuel. If the pressure and temperature of the fuel are below or above the specified limits, the water can boil and produce steam that restricts the flow of fuel. However, this situation can never happen with the BOS EFS as the necessary control measures are built into the system. If the limits are exceeded, the BOS EFS trips automatically. Hence there is no chance of a black out. What happens in emergencies when the engine system switches over to MDO and the fuel is returned to the day tank? This is not a problem. 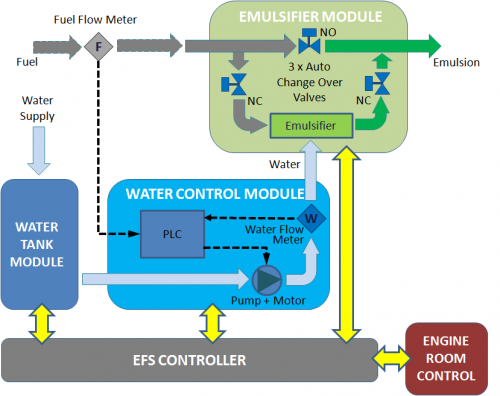 The EFS produces emulsified fuel on demand for immediate consumption by the engine. At any moment, emulsified fuel is only present in the closed-loop part of the fuel pipes in the fuel oil service system, in insignificant quantities. So in an emergency situation, only a small amount of emulsified fuel in the closed-loop is returned to the day tank, from where it will be consumed within a day. Can the emulsified fuel separate into water and fuel before it reaches the engine? Our research and experience has demonstrated that emulsified fuel produced from heavy fuel oil (HFO) is stable and does not separate for up to 21 days. Our emulsified fuel system produces emulsified fuel on demand for immediate consumption and so no emulsified fuel is returned to the day tank. Therefore, no storage of the emulsified fuel is needed and all the emulsified fuel produced is burned immediately. In the case of MDO and MGO, the water will separate out from the fuel after about 1 hour. However this is not an issue as our EFS produces emulsified fuel on demand for immediate burning by the engine. What are the requirements for acceptance by class societies? Depending on which class society (example, DNV, Lloyds, ABS, GL etc) certified the ship, a re-certification by the class society surveyor will be required. Drawings of the emulsified fuel system will need to be submitted to the class society and re-surveying of the new EFS equipment conducted. Since the marine components such as valves, pumps, metres etc is off-the-shelf and so pre-approved, approval by the class society is not an issue. Will the EFS system make the operation of the engine room more complicated for the ship’s engineers? The system is fully automated and complies to unmanned machinery space (UMS) operation requirements. What kind of maintenance does the EFS system require? Since the EFS uses standard and approved parts, the maintenance requirements are the same as those for equipment such as valves, pumps, metres etc. Generally, back-to back standard warranties and maintenance plans are provided by each parts manufacturer. As for the emulsifier, it has no mechanical moving parts and so is essentially maintenance free. How do I ensure the reliable and consistent performance of the emulsifier? The emulsifier is essentially maintenance-free. It has been specifically designed to produce emulsified fuel with the characteristics that will generate the secondary atomization effect. It has no mechanically-moving parts, unlike conventional homogenizers which usually have internal moving components machined to tight tolerances. Conventional homogenizers therefore experience wear and tear that over time causes their performance and reliability to deteriorate unless they are regularly serviced.